GacoDeck Primer can be applied over previously coated and painted surfaces, existing waterproof deck systems and substrates in cold climate zones. GacoDeck Primer is a water-borne, single component elastomeric primer used for adhesion purposes before applying GacoDeck TopCoat. ONE COAT APPLICATION. Coat the substrate with GacoDeck Primer at an approximate rate of 200 square feet per gallon. PREPARATION FOR WATERPROOFING. It provides excellent adhesion for previously coated and painted surfaces, existing waterproof deck systems and substrates in cold climates. LOW VOC. 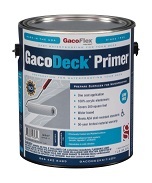 The VOC content in GacoDeck Primer is less than 50 g/l. CLEANS UP WITH WATER. GacoDeck Primer is single-component, elastomeric primer that cleans up easily with soap and water..